Today, while I was studying for my upcoming biochemistry and anatomy exam next week, I contemplated for a short while,"I wonder if Murugan will give His blessings for me to do well on these upcoming exams?" Suddenly, the power in my studio apartment went off. I thought this was unusual, as it had never happened before, especially during the day. I noted that the time of the event was 2:26pm on a friday afternoon. The fan and all the other electrical appliances stopped. Suddenly, I heard loud rumbles of thunder. I quickly peered outside my balcony and saw a huge raincloud approach where my villa (apartment by a lagoon) was. I watched quietly, with a feeling inside that something about all that had happened is not coincidental and it is taking place by a higher power  God! As the rain swept over my villa, I watched the heavy down pour in the lagoon. Suddenly, for a brief instant I saw a small rainbow in the midst of the rain! It was a little rainbow and it was about 20 feet from my balcony suspended in air and in front of me! I was in complete awe. I felt that I could almost touch it. Never in my life have I ever seen a rainbow in the air and 20 feet close to me. All the rainbows I have ever seen, thus, were far in the sky. Realizing that this could be God Skanda's way of showing His presence, I immediately closed my eyes, contemplated on His feet, and said Sri Skanda's sacred mantra six-times. When I opened my eyes, the rainbow disappeared. The rain, too, stopped. All within a matter of few minutes. I looked in the sky for a rainbow, but did not see one anywhere! I went back to my desk to continue my studying. For a brief moment, I thought,"Could it be? Was that Murugan's way of showering His blessings?" Upon thinking this, immediately the power and all the electronic appliances came back on! My dearest and ever-loving God Murugan, thank you for your gracious blessings which you continue to shower on me day-in and day-out. Without your ever protective and caring love, I would not have come this far in my life. I will march forward as your Warrior of Light and complete the forthcoming exams to the best of my ability, with full confidence in my self and in you. Thank you for showering your blessings on me on Oct. 18, 2002. With your Grace I know that I will do well on the exam. May you continue to bless, guide, protect, and be with me every step of the way as I proceed on this path (medicine) that you have chosen for me. I wrote the exam in the morning and the grades were posted later that afternoon. A lot of people failed and just barely passed. I noticed a lot of frowns and complaints about the exam from students, whom I suppose did not do to well. When I looked at my mark, I was surprised a little and content that God Skanda did in fact bless me to do this exam. Through His Blessings did I attain a grade of 100% on my second biochemistry exam. This was the second 100% grade in biochemistry  the other one occurred earlier in my previous experience. I looked at the broad range scores and my score was the only one to reach 100%, except for another person. I guess they, too, must have their secret aid  God! As I was studying for my next exam, medical gross anatomy, I became very tired around 9pm. I don't normally go to sleep around that time, but for some reason I just could not concentrate and wanted to sleep. So, I said a prayer to God Skanda thanking Him for helping me to do well today and to continue to assist me every step of the way, not just through medical school but through life. That night I had a wonderful vision. I saw a huge black, nicely chiselled vigraham (statue) of God Skanda. It was the same form as the one I have on my front door of my studio apartment [See picture on left]. I always pray to this picture when I leave for school and I pray to it when I return. As I was staring at it, I felt a vibration come from within me. I looked at my chest and there appeared an Aum in the Tamil script, as if it was written on my chest. It looked exactly like the Aum I have on my gold chain around my neck which is pierced by Murugan's Vel in the centre [See picture below]. 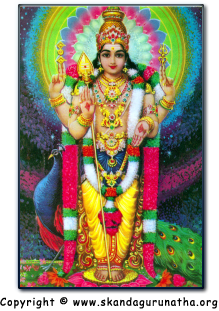 My attention then returned to Murugan. Suddenly His shining Vel lifted in the air by itself and flew directly at me. It entered my heart and disappeared. I then awoke abruptly. This experience taught me that the gold chain I wear around my neck (with a Tamil script "Aum" that is pierced by Lord Murugan's Vel) is not just an ordinary piece of jewelry. In fact, the gold chain was given to me by my loving grandfather (Subramanium Balasundaram). This experience also further proves to me that the incidents leading up to this vision from the rainbow to the biochemistry exam results were all done by our benevolent Sri Skanda's divine will and grace. My dearest Bhagavan Sri Skanda - No amount of words can truly express how much you mean to me, how much you have done for me and are doing for me. I thank you through the only way I know how, by singing your praise (Thiruppugal). I humbly hope and pray that you continue to accept my prayers to you, which I offer with love and humility.